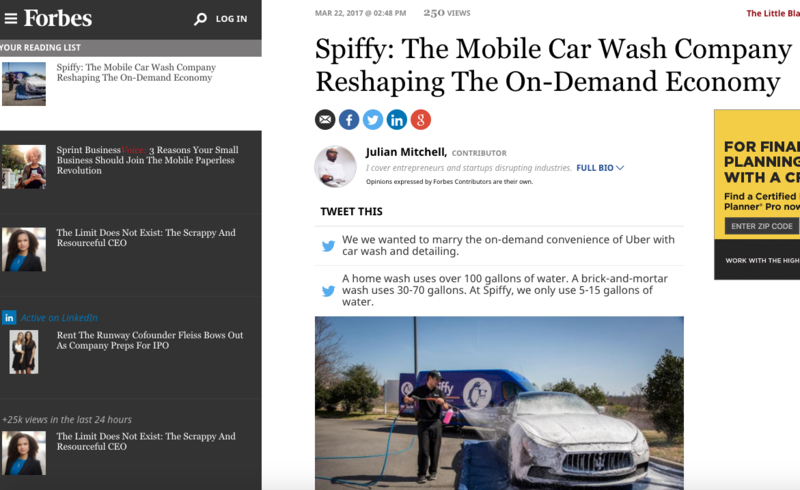 Forbes Calls Spiffy "The Mobile Car Wash Company Reshaping The On-Demand Economy"
Spiffy was featured in a Forbes article today highlighting our impact on the on-demand economy. Forbes writer Julian Mitchell covers Spiffy and talks to our CEO Scot Wingo about his vision behind the company, disrupting the on-demand economy, and his plans for redefining how people take care of their cars. Official Spiffy snack tester. Fond of overusing jokes and underusing shoes. Favorite part about Spiffy: the need to clarify between sarcasm & enthusiasm in meetings.